This item is an original. ILM Stop Motion Vermithrax Dragon Design (Lot 7) by David Bunnett. From the 1981 Industrial Light and Magic stop motion/go motion visual effects groundbreaking movie Dragonslayer. David Bunnett, who was known as a fantasy illustrator with know previous film design experience, had been brought on extremely early into the production and is credited with designing the Vermithrax initially. This is one of his initial designs from March 29, 1980 of an overall view of the final size of the Dragon. It is a Xerox copy that was given to Phil Tippett for future reference. The Design is made from Xerox copy paper and copy ink. This item come from the Nancy and Hal Miles Collection and is accompanied with a Letter Of Authenticity from Nancy and Hal Miles. Nancy and Hal Miles are both internationally renowned animation and movie historians and professionals totaling a combined 80 years of experience. This item has been archival stored or displayed and comes from a smoke free environment. We guarantee all of our items to be as described. However, we are human and we do make mistakes! We will not be answering any questions not related directly to this item such as Do you have any other items for sale that are not listed. Finally, this item is a fixed price sale item and we will not be accepting any best offers or lower pricing offers for it. 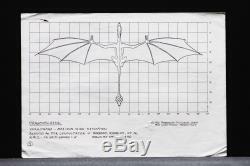 The item "Dragonslayer ILM Stop Motion Vermithrax Dragon Design(Lot 5) by David Bunnett" is in sale since Tuesday, April 11, 2017. This item is in the category "Entertainment Memorabilia\Movie Memorabilia\Props\Originals". The seller is "emily007" and is located in Kissimmee, Florida. This item can be shipped worldwide.